This just in from our VV Flickr Photo Pool! Here's our fabulously dapper friend Dave from Portland! Cycle chic in Santa Barbara from Bike by the Sea. This is one of my personal faves by iMalfet. 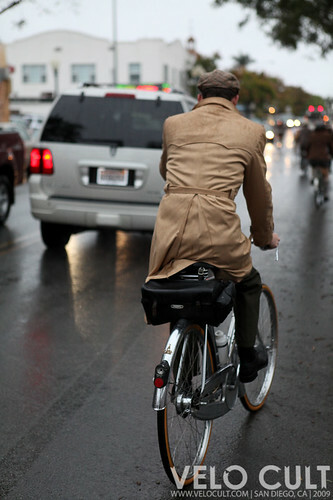 And Anthony from Velocult snapped a wonderful series of portraits from San Diego's first tweed ride. This one from the ride seemed truly cinematic to me, something from a Truffaut film. So it's my favorite from the series. Take a moment to check out all of the photos from the ride. Spectacular! The last one is pretty cool. Velo Cult is awesome and I recommend checking out the store if you're passing through San Diego. How many bike stores sell vintage bikes! Glad you could use one of my photos and thanks for linking.